Vietnamese Prime Minister Nguyen Xuan Phuc has underlined three key solutions for boosting Vietnam’s development during a business summit held in parallel with the ongoing 2017 Asia-Pacific Economic Cooperation (APEC) week. 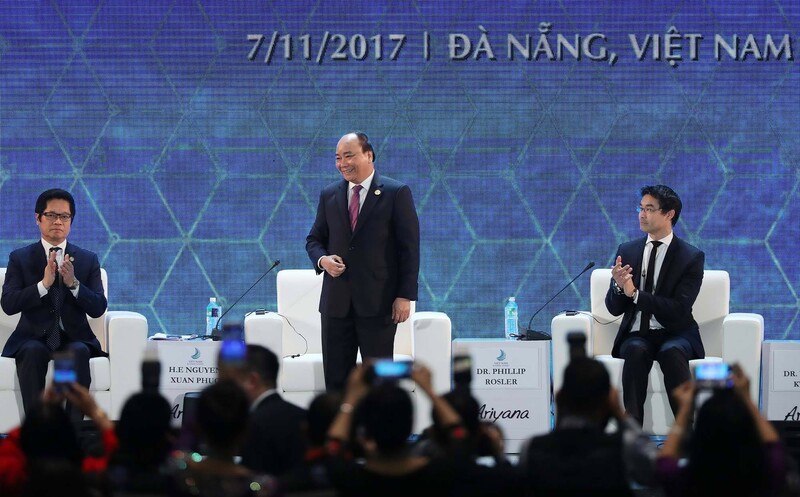 The first Vietnam Business Summit (VBS) was organized in the central city of Da Nang on Tuesday with the attendance of Vietnamese government leaders and officials, representatives from prestigious international organizations, scholars and hundreds of business influencers from across the Asia-Pacific region. During his speech at the event, PM Phuc said that Vietnam was determined to build an action-oriented, enabling government in the service of its people and businesses. “We will continue to pay attention to macro-economic stability, institutional and legal policy reform, sustainable development, job creation and the improvement of living conditions for the people,” he continued. The head of government highlighted three essential solutions for national development in the coming years. Firstly, Vietnamese authorities will continue improving the legal, institutional and policy frameworks, encouraging private sector development, strengthening state governance capacity, maintaining macroeconomic stability toward sustainable growth, ensuring social progress, and narrowing the gap between income groups. “We will focus on investing in infrastructure connecting urban areas to the countryside, mountainous regions and remote areas,” the premier said, adding that Vietnam already pays great attention to the development of healthcare and education, as well as social welfare. Secondly, the country will strengthen its growing start-up and innovation economy by providing favorable conditions, protecting innovative ideas and new inventions, and ensuring intellectual property rights within the framework of Intellectual Property Law as well as within the FTAs that Vietnam is currently party to. PM Phuc called on investors to participate, and hoped for the operation of more start-ups and venture funds in Vietnam to further encourage a strong start-up culture. Finally, focus will be directed toward tax reform to increase the country’s competitiveness, with the aim of meeting the Organization for Economic Cooperation and Development 's high standards of transparency, fairness and efficiency. Vietnam's corporate income tax is currently at 20 percent and will be reduced to 15 to 17 percent in the near future, the premier added. Vietnam will also establish tax incentives for investors in priority fields including high-tech industry, supporting industries, high-tech agri-business, and labor-intensive industries. Answering a question by Virginia Foote from Amcham Vietnam, PM Phuc said that Vietnam would try to achieve a GDP growth target of at least 6.7 percent this year, despite many challenges, including natural disasters. The country will strive for an average GDP growth rate of 6.5 to seven percent in the coming years, the PM continued, adding that the goal will only be met with a stable political and social situation. Speaking at the VBS, Victoria Kwakwa, the World Bank's Vice President for the East Asia and Pacific Region, said that the WB had been supporting businesses in Vietnam, especially smaller-scale ones and those run by female entrepreneurs. Several countries have recently asked for the establishment of a fund exclusively for female entrepreneurs, Kwakwa added. According to Philipp Rösler, member of the managing board of the World Economic Forum, the organization has signed an important deal with Vietnam for economic development. The 2017 Asia-Pacific Economic Cooperation (APEC) week is the culmination of Vietnam’s year-long hosting of APEC meetings. Running from November 6 to 11, the week’s conferences will be attended by world leaders like U.S. President Donald Trump, Chinese President Xi Jinping, Russian President Valdimir Putin, and Japanese Prime Minister Shinzo Abe.